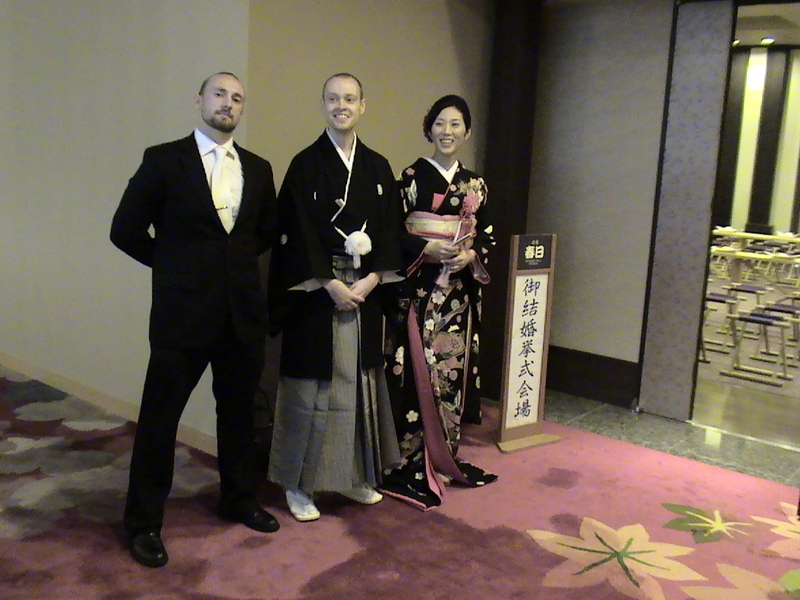 2 weeks ago my good friend Scott and his long-time girlfriend Makiko had a traditional Japanese wedding ceremony, in a hotel up in Niigata. I say ‘had a ceremony’ rather than ‘got married’ because of course- as things are done here in Japan- you get married first in secret at a local ward office, just by signing some papers. Then, when its too late for the parents to protest, you notify them that they’ll need to pay for the ceremony. Hay-ah! How do you like that, parents? I went up with some friends on the Shinkansen to attend. I’m on the left in the picture below, alongside Scott and Makiko. Click ‘Read more…’ below for the full video and details. I rode the Shinkansen with Can. Mike and wife Kumi from Ueno station, meeting up with Scott’s old friend Glenn in Niigata. Glenn came all the way from New Zealand for the ceremony. I’ve seen a Japanese wedding before- Can. Mike’s wedding, at which I also gave a speech. At Scott’s wedding me and Mike made a speech together- which thanks to our attempts to play to both an English-speaking and Japanese-speaking crowd at the same time ended up as a bit of a mess, but in a good-natured and humorous way. Nice job condensing the weekend’s action in the video. I’d like to see more of the Mike and Mike speech in the future though! Congrats to Scott and Makiko. Hey, this was interesting. I was at Thomas’s wedding yesterday – totally different from this of course! Yes, dear boy, you are a Coakley and there is no doubt about that!! You look great all dressed up in your suit!! Hope to be hearing soon that you are in fact planning to see all the Coakleys very soon!! Good work on the video mate. Especially that super-cool sideways bit. It was artistic. Mike!!! When are you getting married squire!? Jason- cheers. The Mike and Mike speech, yeah- with all the translation efforts its a bit of a grind to watch. Alice- Uncle Bobby huh? When I go bald though- I’ll just shave it all off. Mom- Thanks on the suit- you bought it for me! Coakleys trip, yep, very much on the schedule. Glenn- Sideways bit, that did shake it up a bit eh? And of course- impressive eating of hot sauce. Maxx- Married, me? Some time off, I imagine. And yourself? Hey Mike – thanks for linking to my blog. Actually, I had dropped by yours via JC’s blog a few times. Interesting ruin-crashing hobby you have. Anyhow, check out the “frisbee” pics on my blog (Apr 6 ’08 etc) – I found a pretty cool disc golf course with serious slopes. Let me know if you want to give a try sometime (though I may be busy for a while –> baby due on 08/08/08)! Also, congrats to Scott, though I married the better Makiko ;-). Didn’t realise the parents were supposed to pay for the ceremony in Japan though… Ouch! Baby! Nice work Vince- as for the golf course, are there pictures/directions on your site? I’m definitely keen to learn more. Will go search now. Whatever camera you’re using is awesome. Tony- Thanks- though it’s not my camera, it was a rented Sony Camcorder that Scott got for me for the occasion. It had pretty good resolution yes, but editing the footage was a major pain- seems that Sony footage only works with Sony products- so I had to ‘buy’ Sony’s editing suite Las Vegas. It wasn’t bad- but I hate that kind of closed product loop mentality. I got married in Japan as well and I was wondering did Scott have to say anything in Japanese during the ceremony? I spent days memorizing my “vows” ( I think it was actually requesting a blessing ) but my wife didn’t have to say anything except her name. Looks like everyone had a good day. Hi Declan- thanks for you comment- yes Scott did have to memorize something, but I don’t think they gave him too long to do it as he was pretty faltering in his reading. I guess they sprung it on- lucky guy hey. Pictures, right, I don’t know- it’s quite possible I wasn’t supposed to be shooting, the pro photographer they’d hired was hiding behind some kind of screen. But I was only filming, which is noiseless and flash-less, plus I’m not Japanese, so maybe they just gave me the benefit of the doubt. It was a good time yeah. Did you have your wedding in a shrine/temple, or hotel like Scott?